Birla Mandirs (or Birla Temples), are located in various parts of India. Birla’s family, a leading industrialist in the nation, constructed these temples in different cities in India. Dedicated to various gods, these white marble constructions display architectural excellence in their making. Let us travel to these parts to have an idea about Birla Mandirs they are proudly home to. 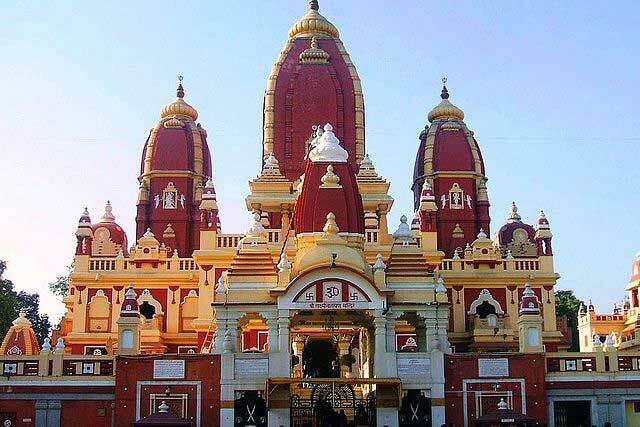 Laxmi Narayan Temple, famously called the Birla Temple of Delhi, is one of the most popular temples in Delhi. It was constructed in the year 1938 by G.D. Birla. Dedicated to goddess Laxmi, goddess of wealth and the preserver, god Narayana, the temple gains historic importance being a symbol of unity among various castes. Gandhi had demanded that the temple be open for all castes if he were to inaugurate it and ever since its inauguration it remains open to all regardless of caste. Paintings that portray Indian mythology are seen in Geeta Bhavan in Birla Temple. The influence of Oriyan style of architecture is seen in the temple. With gardens and fountains adding beauty to the white marble and red sandstone construction, the temple is spectacular to look at. The paintings in the upper gallery are a fine specimen of artistic excellence of Jaipur artists. The Rajasthani paintings reflect the cultural heritage of the land. 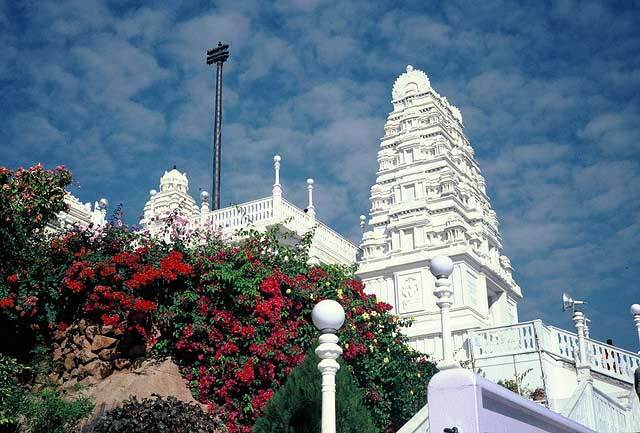 Birla family constructed Birla Mandir in Hyderabad in the year 1976. Located in a scenic environment at the top of Kala Pahar, which is at the southern end of Hussain Sagar Lake, the temple is a blend of Oriyan and South Indian style of architecture. Lord Venkateswara is the chief deity in the temple and the other deities are goddess Padmavathi and Andal. Viewing the temple at night is awe-inspiring thanks to the illuminating lights and the 11 feet tall granite image of Lord Venkateswara adds magic to the air. The ‘Mukha Mandapam’ in the temple houses excellent carvings in marble, which reflect Indian mythology. Started in the year 1970, it took 26 years for the completion of the entire temple. The deities in the main temple are Krishna and Radha. The left side dome has goddess Durga and the dome to the right has the deity of goddess Shakti. The architecture is a fine specimen of Rajasthani style. Depictions from Bhagavad Gita are seen in the stone engravings found here. 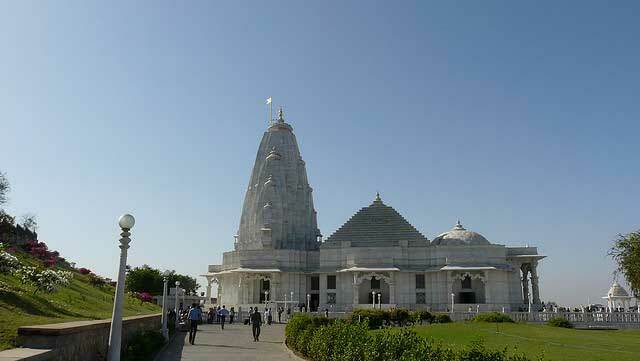 Birla Mandir in Kurukshetra was constructed in the year 1952 by Jugal Kishore Birla. The temple is dedicated to Lord Krishna. A large-sized chariot made of marble capture your attention as you enter the temple’s garden. In the chariot, Arjuna, the warrior and Lord Krishna are seated and it is drawn by 4 horses made of marble. You also find eighteen other marble characters around the chariot depicting the scene of Mahabharata. Vithoba Rukmini Temple, known popularly as Birla Temple in Shahad, is an amazing construction that appeals to your senses the moment you set your eyes on it. To both sides of the temple’s gate you will find two huge-sized elephants carved of stone. The gate is beautifully carved and it offers a great visual feast. Fine representations of various Hindu gods are seen in the carvings on the temple walls. The temple boasts of amazing artwork in every inch of it. Built in the year 1959, Birla Mandir at BITS, Pilani is a white marble marvel of twentieth century. Covering a sprawling 25000 square feet area, the temple dedicated to goddess Saraswathi is a reflection of Indo-Aryan style of architecture. The temple stands majestically on 70 pillars and the entire construction together is on a basement measuring 7 feet height. Above the sanctum lies the pyramidal tower measuring 110 feet height. The temple is a blend of spirituality and modern science as you will find figures of saints as well as scientists in the temple. Birla Mandir in Bhopal is a twin pleasure. Not only is the temple, its location as well breathtaking. Situated on top of Arera Hills, the temple dedicated to goddess Lakshmi, is a must-visit place in Bhopal. The temple holds you captive with its sandy-yellowish shade and the rich greenery around. The main shrine houses idols of goddess Lakshmi and god Vishnu and the other shrine here has the idols of goddess Parvati and god Shiva. Birla Mandir in Bhopal has a museum, which has a fine collection of ancient sculptures that date back to 12th century. Jaipur’s Birla Mandir temple is located below Moti Dungri Fort. It was built in 1988. Famously referred to as Lakshmi Narayan Temple, Birla Mandir in Jaipur is dedicated to god Vishnu and his wife goddess Lakshmi. The temple breaks away from traditional style of temples of the past and displays a modern treatment to it. On the walls of the temple, you will find quotes from Bhagavad Gita and fine carvings of symbols representing Hinduism. One of the interesting features of the temple is that you will find pictures and sculptures of saints as well as famous personalities that made their times proud such as Socrates and Buddha. 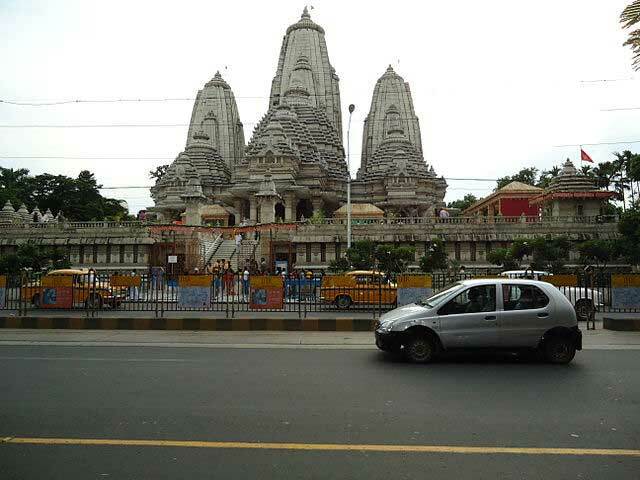 Birla Mandir built in Patna, the capital of Bihar, is dedicated to Lakshmi Narayan. It is also called as Lakshmi Narayan Temple. 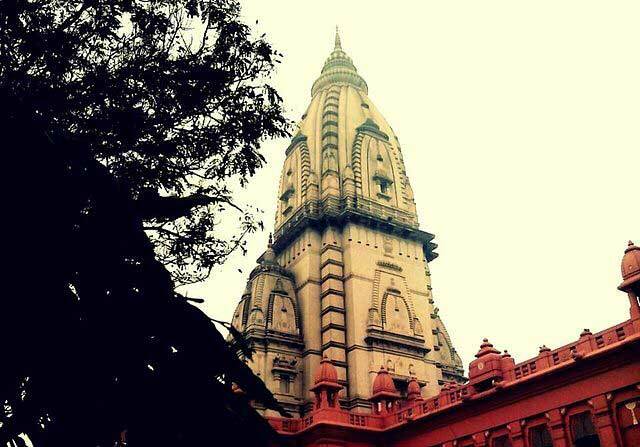 Popularly known as New Kashi Vishwanath Temple, Birla Mandir in Varanasi is situated in Banaras Hindu University premises. Nearly three decades had passed from the time the foundation stone was laid in the year 1931 to complete the construction of the temple. Lord Shiva is the chief deity in this temple, which is a replica of the original temple. The spiraling top measures 252 feet height. The huge temple complex houses seven temples. The temple of Lord Shiva is on the ground floor and the temples of Lakshmi Narayan and goddess Durga are at the first floor. Renukeshwar Mahadev, one of the most frequented spots in Renukoot was built by Birla Group in the year 1972. After undergoing many changes since, this Birla temple in Renukoot looks stunningly beautiful. The main entrance welcomes you with incredible carving that presents Sun god on the chariot. The second gate presents stone carvings of elephants at either side. The sculptures in the temple are fine specimen of the artisanship involved in the making. Competing with the architectural splendor of the temple, the scenic landscape elevates your spirits. The rich landscape with garden fountains make this place a perfect location to feel inner peace. 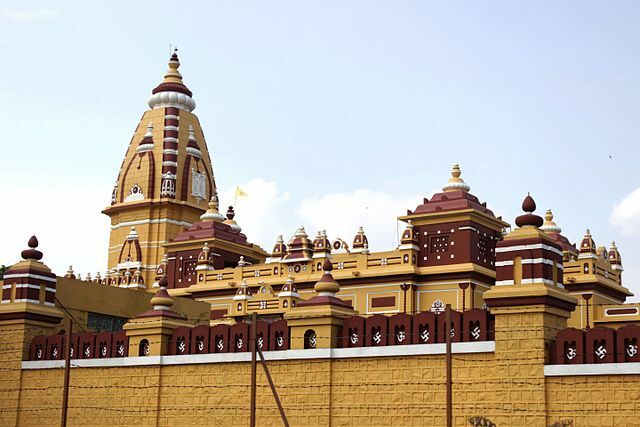 Birla Mandir at Akola is also known as Shri Ram Temple. 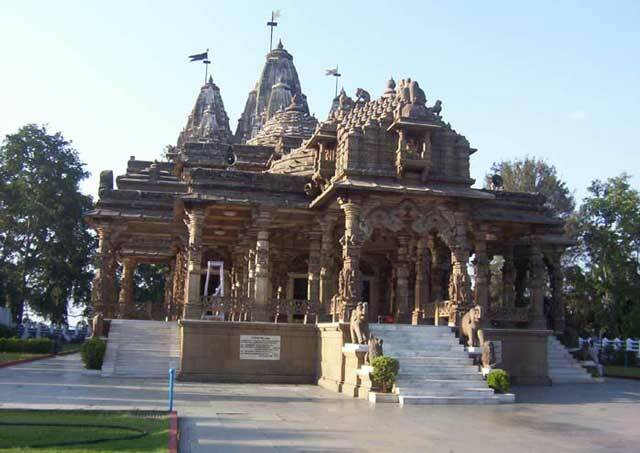 A city in Maharashtra, Akola has many famous temples. Birla Mandir along with other famous and ancient temples attracts visitors in great numbers. Nagda is a beautiful city situated near Udaipur. The city has many tourist attractions and Birla Mandir ranks amongst them. Dedicated to Lord Vishnu, the temple is serene with a picturesque garden. The vast expanse of the garden is awe-inspiring as you enter the temple complex. The temple, like every other Birla Temple in India, attracts you with its amazing architecture with intricate designs. Brajrajnagar, a city in Odisha, is famous for coalmines and paper mills. Yet another important attraction in the small land is the Birla Mandir built by Birla Group. The beautiful temple adds a touch of serenity to an otherwise industrial locality. Birla Mandirs have been constructed in various parts of India, some busy and big metropolitan cities and some in a calm and remote place. Wherever they are, they display dedication and architectural brilliance of the artisans involved in their making. If you happen to tour to a place that houses Birla Mandir, ensure you make a trip to the temple, which is a blend of ancient belief and modern style. Great list of all Birla Temples. I have visited Shahad temple and it is very beautiful.